Check out this slideshow of our fabulous trip to Yellowstone, then sign up to join us on one of our weeklong trips! From Carol Ruhter, Trailbound Trip’s founder and guide. Arizona ~ Oct. 19-25 or Oct. 26-Nov. 1, 2019 Sedona and the Grand Canyon beckon...	Oct 19-25 is full. Interested? Email and ask to be on our "1st dibs" list. No cost/obligation. Glacier National Park(MT) ~ July 13-20, 2019 -or- July 20-27, 2019 Discover stunning hikes, glacier-studded mountain peaks, wildlife galore, dips in glacial lakes, vibrant wildflowers, towering waterfalls, warm camaraderie, lifelong memories, and your own adventurous spirit! Shenandoah ~ June 1-7 & June 8-14, 2019 For one amazing week, treat your spirit and body to a tranquil wilderness haven and outdoor adventure. Apostle Islands ~ Aug. 3-7, 2019 or Aug. 7-11, 2019 The Apostle Islands offer an island retreat right in the Midwest! This archipelago of 22 islands is nestled in Lake Superior, off Wisconsins northern coast. 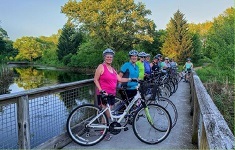 Explore Sheboygan Shoreline Getaway (WI) ~ Sept. 27-29 and Sept. 30-Oct. 2, 2019 Hike on pristine Lake Michigan beaches, cross rolling dune boardwalks, and along scenic lakes tucked in Wisconsin forests... Trek an autumn fantasyland of glacial kettles and moraines, hardwood forests and towering pines, tallgrass prairies and fall wildflowers...Explore ancient Native American effigies... Discover why some call Sheboygan the Malibu of the Midwest for kayaking, paddleboarding, and surfing...Relax in a 5-star resort. Jill May (aka "Chippermunk") leads Trailbound day hikes and getaways. Jills love of the outdoors began as a young child in the Girl Scouts. Shes an avid camper and hiker, and calls the woods her "happy place." A few of her favorite happy places include Southwest Colorado, Michigans Upper Peninsula, and the Great Smoky Mountains of East Tennessee. She also enjoys biking, kayaking, swimming and spending time with her family. As an Integrative Nutrition Health Coach, Jill works with kids who struggle with emotional and mental health issues and physical challenges. Jill lives in Palatine, IL, with her outdoor-loving husband and two sons. Our outdoor adventures delight, inspire, encourage, and strengthen women. walk through pristine winter wonderlands. Snow-capped mountain wildernesses packed with wildlife and beauty. (Trails by day; lodges by night). Breathtaking beauty, unforgettable trails, and true outdoor adventure. Your own adventurous spirit, renewed confidence, and exhilaration. Tranquility: time to walk in silence, savor beauty, play outdoors again. Friends who share your love of nature and the outdoors. New ways to view nature and yourself through nature-based discussions. We also offer trips with a Christian focus, which are noted accordingly. Enjoy this all with the friendliness, knowledge, and encouraging can-do attitudes of your experienced guides. Join us! Explore. Dream. Discover. Day trips in Northern Illinois:: Jan 2 - Feb 23. Guides: Scout, Wander Woman, Spirit, Zephyr & Chippermunk. Day trips in Northern Illinois: Apr 16 - Jun 1. Guides: Scout, Wander Woman, Spirit, Zephyr & Chippermunk. Glacier National Park (MT): July 13-20 & July 20-27. Guides: Scout, Wander Woman & David R.
Day trips in Northern Illinois: Sept 3 - Oct 26. Guides: Scout, Wander Woman, Spirit, Zephyr & Chippermunk. Be sure to , where you can check out the fun and the beautiful places we visit! 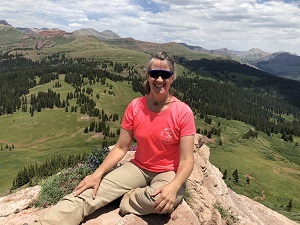 Youll love the great nature videos, quotes, and photos that Nancy posts...along with Trailbounds activity updates and trip photos. To be sure youre getting our page updates, be sure to "like," comment, and/or share our posts. And if you see yourself in one of our photos, go ahead and "tag" yourself so your friends can see what a great time youre having with us! Because Facebook only sends our posts to about 20% of our list, the more you participate, the better the chance of Facebook sending you our updates. And of course, you can always visit our Facebook page directly at any time to see whats happening. See you on Facebook! Note: Trips listed below in YELLOW now have openings; those in WHITE have wait lists.